In theory, Parkinson’s is a simple disorder. The simple cause of Parkinson’s is lack of, or poor performance from, one of the enzymes to create dopamine. In almost all cases, tyrosine hydroxylase is the problem. Giving people with Parkinson’s L-Dopa allows them to make dopamine using the dopa decarboxylase enzyme. But as you look at this diagram, you see why Parkinson’s can keep getting worse. Look at that the red section on the left. Dopamine producing cells die off due to toxicity produced by the interaction of tyrosine without the tyrosine hydroxylase enzyme. And after those cells die off, motor cells die off. Once that happens, it doesn’t matter if dopamine is restored, and the only thing that will improve Parkinson’s is stem cells, induced pluripotent stem cells (iPSC’s). Gene therapy directed at tyrosine hydroxylase may help, but only in the earliest stages. 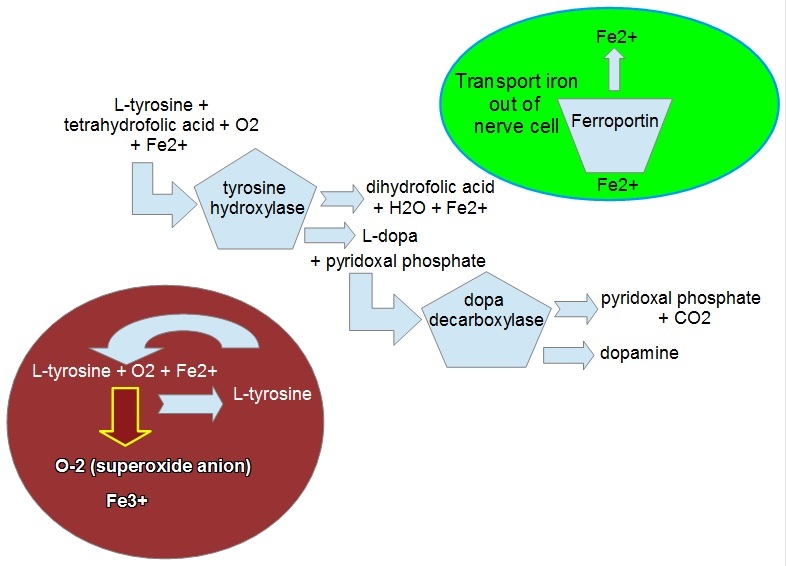 Making L-dopa requires iron (Fe) for the tyrosine hydroxylase to work, and human brains build up iron as we age. (Iron build up may by one of the roots of age-related mental decline.) Eventually, enough free iron and tyrosine is present to react directly with oxygen in the absence of the enzyme. The tyrosine isn’t destroyed, so this reaction can just keep ticking along. Superoxide and charged iron are very reactive and damaging to the cell. If there’s too much, it will kill the cell. And when L-Dopa is given, that turns off whatever tyrosine hydroxylase activity is still going on, which may raise the production of superoxide anion and Fe3+. Another cause of Parkinson’s can be nutritional. Lack of tyrosine and lack of folic acid can be factors. Supplementing folic acid is a good idea if Parkinson’s runs in your family. Raising tyrosine has worked after symptoms start, but it should be coordinated with your physician. In theory, if your Parkinson’s is genetic, flooding the system with tyrosine might speed up the production of superoxide anion and Fe3+. Taking coenzyme Q10, and vitamins C and E should help, and is a recommended good practice from an early age if Parkinson’s runs in your family. There are a number of drug treatments and none are perfect. The most effective are mixtures of L-dopa and another drug, such as carbidopa, that stops the conversion of L-dopa into dopamine outside the brain. Entacapone improves transport of L-Dopa into the brain. A good course of therapy will provide these drugs and improve matters. Deprenyl/Eldepryl (seligiline) produces amphetamine and may be associated with higher mortality for currently unknown reasons. Various dopamine agonists stimulate dopamine receptors, but this also results in the receptors becoming less sensitive. SSRI drugs and ritalin (ADHD treatments) are recommended for Parkinson’s. When the cell death that is caused by Parkinson’s occurs, that affects other neurotransmitters as well. Parkinson’s symptoms are just the most obvious. Patients shouldn’t feel the are required to, but exploring them may be helpful. Exercise helps people with Parkinson’s. Why is not entirely understood, but probably part of it is stimulation of the motor nerves which probably keeps them in shape. Parkinson’s is improved by passive exercise too, as shown by Parkinson’s patients riding on the back of a tandem bicycle at a faster cadence than they are able to keep by themselves. That effect lasts for several hours, and may slow progress of the disease. Another factor is that fairly high level athletics raises catalase levels in the body, and that would protect against nerve damage from superoxide anion and Fe3+. Last, the DNA of athletic people can be 10-15 years younger by the age of 50 than sedentary people. It may be the case that when buildup of iron in the brain overwhelms the level of tyrosine hydroxylase to use it, eventually dopamine producing cells begin to die from superoxide. All of this presents challenges for gene therapy. First, we need to know if the Parkinson’s is due to lack of tyrosine hydroxylase. If it is, gene therapy may help. Second, we should find out what the iron level is in the substantia nigra. If it’s higher than it should be, a gene therapy may help. In general, a catalase gene therapy should help to minimize brain damage. Some forms of Parkinson’s are caused by mutations in alpha-synuclein and development of Lewy bodies. Anti-synuclein antibodies may be of some help. Around 0.1% of antibodies injected make it across the blood-brain barrier. Another possible treatment for alpha-synuclein mutation is to supply a correct copy by gene therapy. For people with significant Parkinson’s the only thing likely to reverse it is iPSC therapy, perhaps with some gene modifications. For instance, gene therapy in iPSC’s, would be a good choice for alpha-synuclein mutation since it is unlikely that this form of Parkinson’s would be caught early enough to intervene effectively with a gene therapy alone. Gene therapy may be able to stall the progress of Parkinson’s, but that’s all that can be expected. Posted in alpha-synuclein, iPSC, Parkinson's, stem cells, tyrosine hydroxylase and tagged gene therapy, Parkinson's gene therapy, Parkinson's treatment. I would love more info. Early onset Parkinson’s at the age of 24, now 35. Tested positive for double recessive Parkin gene mutation.